Do you CareMoor for Exmoor? We love our landscape, and we know this is what attracts visitors to Exmoor each and every year. The National Park is free to access but you can help us to CareMoor for Exmoor by making a small donation towards nature, heritage and Access projects that wouldn’t otherwise happen. Every year thousands of people donate to CareMoor for Exmoor which is administered by the National Park Authority. These donations provide vital funding support for important initiatives such as providing boardwalk to create access to the rare salt marshes at Porlock, providing dormouse nesting boxes and conserving historic features. Every penny of every donation goes direct to good causes. "If every visitor donated just £1 we could raise over £2 million each year to sustain the National Park today and forever." For further details on how your donation could be used visit the CareMoor website. Via supporting local attractions and accommodation providers. By sending a cheque to Exmoor National Park (CareMoor), at Exmoor House, Dulverton, TA22 9HL. Exmoor was the first English National Park to achieve the European Charter for Sustainable Tourism in 2007. 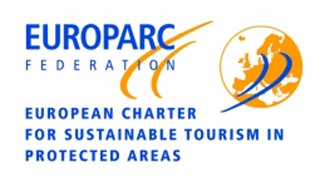 The European Charter for Sustainable Tourism is a practical management tool which helps protected areas to continuously improve the sustainable development and the management of tourism taking account of the needs of the environment, the local population and the local tourism businesses. The Charter is not a typical quality or eco-label but a process-oriented methodology that can be used and applied by all kinds of protected areas. The Charters focus is on initiating and assisting a process of sustainable tourism planning which will lead to sustainable development step by step. The Charter assists this process by providing a 'strategy development kit' which contains principles, a methodology and check-lists for the protected areas to work with. The implementation of the Charter methodology increases the awareness of and support for European protected areas.